Dr. Rao was very easy to talk to and thorough in her examination. She was very attentive to my health needsand took the time to answer any of my questions. The facility was beautiful and clean. Dr. Rao was very easy to talk to and thorough in her examination. She was very attentive to my health needs and took the time to answer any of my questions.The facility was beautiful and clean. Dr. Rao is very friendly and immediately put me at ease. She listened carefully to all my problems and took adetailed history. I got the impression that she really cares about her patients and would definitely recommend. Dr. Rao is very friendly and immediately put me at ease. She listened carefully to all my problems and took a detailed history. I got the impression that she really caresabout her patients and would definitely recommend. 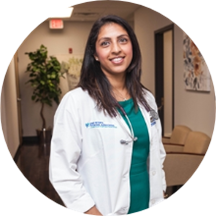 Certified by the American Board of Internal Medicine, Dr. Megha Rao is an accomplished internist and primary care doctor. She earned her medical degree from the American University of Antigua College of Medicine. She then went on to complete a residency in internal medicine and an internship at Saint Peter's University Hospital. She is also residency trained in internal medicine at Drexel University. Dr. Rao currently practices at Saint Peter's Healthcare, serving the community of Piscataway, NJ. Fluent in English, Spanish, and Kannada, she is widely accessible to patients from a variety of cultural backgrounds. She gives her patients her undivided attention and practices with the goal of helping each of them lead healthy and fulfilling lives. Dr. Rao is a zealous researcher and an active member of the American College of Physicians, American Medical Association, and the American Association of Physicians of Indian Origin. She integrates her clinical expertise with advancements in medicine and technology to ensure patient safety and recovery. When she is not seeing patients, she enjoys cooking, running, and spending quality time with her family. Dr. Rao was absolutely great! She made me feel comfortable and at ease throughout my appointment. She took her time and listened carefully to all my concerns. I am happy to have chosen her as my pcp. Dr Rao has wonderful bedside manner. She listens to all of your concerns and genuinely wants to help. Her staff are equally as amazing! Dr. Rao is very sweet and extremely professional. She didn’t rush through the appointment and took the time to really listen. She made me feel like I was part of the medical decision making process. She was very personable and the office staff was great. I hate going to the doctors. Terrible experiences, many rude, others take my health as a joke. Doctor Rao is the BEST! She’s concise, comfortable, and very caring. Thank you so much!